What are the different types of cooking oils? All cooking oils are a combination of these three general categories of fats: saturated, monounsaturated, and polyunsaturated. These categories refer to the fat’s chemical structure, and sufficient for this post to say that saturated fats are the most chemically stable and thus the least likely to become damaged, monounsaturated fats are somewhat stable and somewhat likely to become damaged, and polyunsaturated fats are the least stable or most likely to become damaged. You can fairly easily identify a saturated fat because it is solid at room temperature (unless you’re far away from Portland in the winter, in a place where room temperature is pretty warm and coconut oil is no longer solid). Monounsaturated fats are solid when they are in the fridge (ever put an olive oil based dressing in the fridge and see it start to solidify?). Polyunsaturated fats are always liquid. What happens if an oil becomes damaged? If the chemical structure of the fat is damaged, it can cause an inflammatory response in the blood, liver, gut, or various other places in the body. It is generally understood that excessive inflammation plays a role in the development of many chronic diseases, as well as contributes to very common health issues such as seasonal allergies, joint pain, and headaches. 1 Needless to say, we want to avoid the excessive inflammation caused by damaged fats and oils as much as possible. How can an oil become damaged? Exposure to heat, light, and oxygen. As previously mentioned, saturated fats are the most stable so they are least likely to become damaged when exposed to heat, light, and oxygen, whereas polyunsaturated fats are the most likely to become damaged when exposed to these elements. How do we categorize the different cooking oils? As you may suspect by this point – butter, coconut oil, and animal fats are my top picks for cooking, because they are the least likely to become damaged when exposed to heat, oxygen, and light. I generally recommend these as ideal choices for any type of cooking - grilling, sautéing, roasting - since they will likely hold up best at any level of heat or length of cooking. It is very confusing to get bogged down in smoke points and low temperature vs high temperature cooking. Sourcing is really important for these, as with anything we eat. The best options are always locally sourced or from a grass-fed organic farm – I love Kerrygold butter. For coconut oil, unrefined or virgin coconut oil is far preferable to refined coconut oil. Refined coconut oil undergoes various refining, bleaching, and/or deodorizing processes to arrive at a flavorless, odorless oil, whereas unrefined coconut oil is – as it sounds – less refined, more nutritious, and also tastes like coconut. I generally buy whichever unrefined, organic coconut oil is the best discount, and lately I’ve been buying Thrive Market’s brand. What can I do with seed-based oils? Some seed based oils are best eaten raw because they are so fragile that when exposed to heat in cooking, they can easily become damaged as well as lose their nutritional value. Avocado, walnut, and flaxseed oil are great options for salad dressings or otherwise raw. Sourcing and storage are critically important here: these oils should be purchased in dark, glass containers to allow for less exposure to light and oxygen, and it is best to store them in a dark cupboard or (even better) in the refrigerator. Buy these oils in smaller quantities that you will use up within a month or two. If you have one of these that has been in the back of your cupboard for a year, it’s probably not good anymore. Most other seed or vegetable based oils I recommend avoiding altogether, as the extraction process adds chemical solvents to the oils and/or damages the oils before they even make it to the grocery store. These oils that I try to avoid include canola, corn, sunflower, saffron, and soybean oil. You may have heard grapeseed oil recommended for high heat cooking, but it really would only be beneficial if eaten raw because it is an unstable polyunsaturated oil. Since most people don’t eat it raw, I don’t recommend the use of this at all. You can read more about the specific issues with each of these oils here. If all these seed-based oils are bad to cook with, why are they always recommended? Generally speaking, seed oils are more highly processed than the saturated fats (coconut oil and animal fats). You can “process” your own bacon grease at home: cook the bacon and save the fat in a jar to cook with later. But I’m guessing you don’t have the tools, time, or expertise to extract oil from your avocado pits at home. These more processed oils generally have higher smoke points, and this is why I don’t think the smoke point is a good measure of whether an oil is acceptable to cook with. The smoke point really only indicates at what point an oil – in its current state – will start to smoke and break down. However, there is no regulation on smoke point claims (which are often misstated) and if an oil has already been partially broken down through refining, it may now have a higher smoke point, but that is only because partial breakdown has started, and continuing to heat it to high temperatures would not be healthful. Read more on this topic here. Few topics have been more hotly debated than whether you can cook with olive oil. Here is my take on it: Olive oil is a monounsaturated fat, so it is more stable than most seed oils but less stable than animal fat, butter, and coconut oil. Olive oil is not my default cooking oil, however, it has high concentrations of chemical compounds called polyphenols and tocopherols that have been proven to protect olive oil at high heat. If you’re into reading studies, check out this study, this study, and this study . 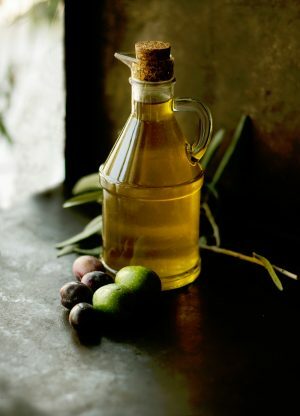 I am very comfortable cooking with olive oil due to these protective agents, although I prefer to use saturated fats for cooking, and save olive oil for pesto or salad dressings. Olive oil should also be purchased in dark-colored glass, and some good suggestions for affordable options are here. Which oils should I avoid in packaged foods? The number one oil to avoid in packaged foods is fully or partially hydrogenated oil of any kind. The hydrogenation process basically turns liquid fats solid, but so completely damages the fats in the process that we all want to stay far away from these. I also generally try to avoid vegetable oils in packaged foods (canola, palm, soybean, safflower, etc), but so long as you are not sensitive to these foods, if they sneak their way in now and then I wouldn’t worry about it. I hope this sums up cooking oils for you and helps make your choices at the stovetop a little easier. It’s important to cook with healthy oils. It’s MORE important not to stress too much about this minutia, and enjoy the food you eat. If you missed my post on de-stressing when you eat, you can read that here.